Did you know that just 8 strawberries have more vitamin C than a medium orange, is a good source of folic acid and it is the only fruit that has its seeds on the outside? Strawberries are perennial plants. By planting strawberry plugs in the Fall you can start picking berries when spring arrives! Most strawberry plants are sold in the Spring as bare root plants. Bare root plants must be cared for until the following Spring to get a good crop yield. Strawberry plants grow well in many soil types. Start with a weed-free location that gets plenty of sun (minimum of six hours) and has good drainage. Strawberries like raised beds and containers. For best results, the soil should contain at least 3% organic matter in the form of compost or peat and have a pH between 6 - 7. 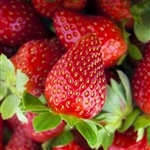 Strawberry plants are susceptible to the fungal disease Verticillium so avoid planting strawberries in soils where potatoes, peppers, and tomatoes have been grown in recent years. Make sure your plants are watered thoroughly before planting. Space your plants 12" to 18" apart in the rows 3' to 4' apart. Dig each planting hole deep enough so that the transplant roots will not be bent when covered with soil. Next, fill the hole with loose soil, keeping the upper crown bud at or slightly above the soil line, as plants will die if the crowns are completely covered. Once planted, strawberries will spread by producing "runners" where leaf cluster tips touch the ground. As perennial plants, strawberries must endure winter temperatures and may experience damage if the crowns experience temperatures well below a hard freeze. Mulching strawberry plants help prevent quick freezing and thawing which can affect plant survival. Mulch has a large volume of airspace to help hold warm air near the plant through cooler periods. Mulch also keeps weeds down, conserves moisture, helps keep fruit clean, and adds humus to the soil. Good mulch alternatives for strawberries are wheat, salt hay, oat straw and wood chips. Materials like leaves can mat down and smother the plants if applied too thickly. Mulch strawberry plants in mid to late November when the plants start to go dormant and air temperatures are generally low enough to reduce any disease susceptibility. Fourteen to sixteen pounds of wheat or oat straw should give a 2 inch cover per 100 square feet and provide adequate protection. In the Spring, when new growth starts, remove the mulch from the top of the strawberry crowns but be careful not to remove the mulch too early and increase the susceptibility of frost damage to blossoms. Leaving the mulch between the rows will help keep the fruit clean.